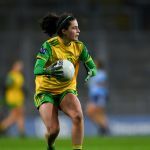 It did not get any better on the resumption and Cork raced into a nine-point lead before Maud Annie Foley kicked Westmeath’s second score at the death. In Division 2, Armagh have already opened up a two-point lead at the top of the table thanks to their comprehensive win over Cavan at Clonmore on Sunday. Aimee Mackin hit a goal in each half for the Orchard girls, who were far too strong for their visitors in a 2-17 to 0-3 win.